DisableNodes helps speed up your compositing workflow by disabling heavy nodes. You can select nodes you choose to disable, either by the predefined class-buttons, selected nodes or selected class, and then link them together and control the disable/enable from this tool by pressing 'd' for disable. You can also control the ScanlineRender sample values in your Nuke script. Or simply use it as a quick way of comparing before and after grade etc. DisableNodes helps speed up your compositing workflow by disabling heavy nodes. You can select nodes you choose to disable, either by the predefined class-buttons, selected nodes or selected class, and then link them together and control the disable/enable from this tool by pressing 'd' for disable. 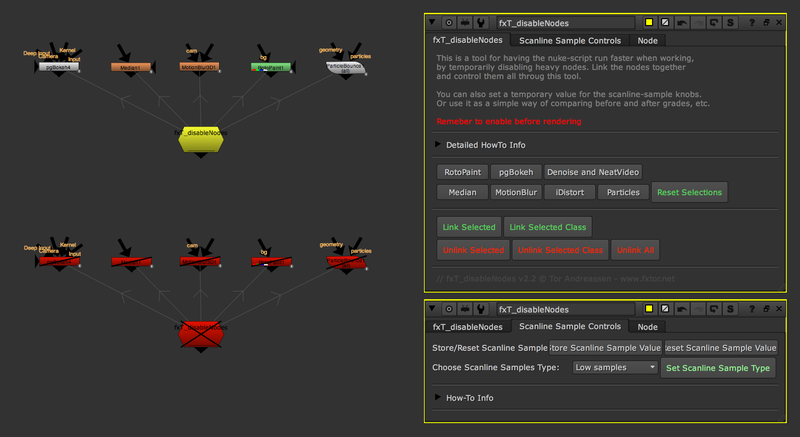 You can also control the ScanlineRender sample values in your Nuke script. Or simply use it as a quick way of comparing before and after grade etc. - Seamless integration to the Nuke Menu (including custom icon). - Keyboard shortcut to create node (alt+d). - Automatic and manual controls for selecting nodes and all nodes of a certain class type. Fixed issue where the original color of the node was not kept when disabling/enabling. For example if a Blur node had custom color, enabling or unlinking would restore the original nodecolor instead of the custom set color. Same with groups, which would always go back to default grey color. This version keeps the original node color when disabling/enabling and unlinking. Also removed the 'enable/disable' button, as I never really used anything but the 'd' shortcut to disable the node. - Callbacks now make sure that the node and the linked noded turnes red when the nodes are disabled and go back to the defalt nodecolor when its enabled. This makes it easier to see what nodes are diabled, so its easier not to acidentlaly click render before remembering to enabeling the nodes, simply a visual help to remind the comper the fxT_disableNodes is in use. - User interface updates: removed some buttons for selecting noded that I rarly used, and added a pgBokeh button, update knobnames to more logic names, and updated how-to explination text and tool tips for all knobs. - Tool is no longer a toolset, its changed to a gizmo. However it's open like a group, for easy access to modifying it on the fly. - 100% python: All operations are done with python (python buttons). This makes it compatable with all versions of Nuke and all OS'es. - Added support for storing ScanlineRender sample values. One can store the values, and set a temporary value of 1 in all your ScanlineRender nodes - to have them render faster, then when ready to render, pop back the original values by the click of a button. - Saftey features for the scanline render samples value, you can not accedently replace the values with temp values before your custom samples values is stored. - The node is no longer dependent on the node's name to function, this mean that you can have as many nodes as you want. F_Regrain, all MotionBlur nodes, RotoPaint, GridWarp, SplineWarp, All paricle nodes. Or select your custom nodes by hand. - Updated look/layout on the nodes graphical user interface . - Better documentation for how the node works, with text in the node for explination and tool-tips with descriptive information. To install the Gizmo in it's own nuke menu with the attached menu icon: please see attached 'init.py' and 'menu.py' files. Install the Gizmo and icon files according to the paths in the 'init.py' file, or alternetivly change these paths to your own preferred install location. Very strange, when I try to put it in the node graph I get this error. "'NoneType' object has no attribute 'showControlPan el'"
this is indeed strange, thanks for reporting. Are you trying to incorporate this with your current menu.py? if so maybe you left out some commands/files/folders? If not can you tell me specifically what makes this error occur? are you copying the node?, changed some code, or did you just copy paste what was in the install file?, what OS and what version of nuke are you using ect. I was trying to replicate your error by altering the code but could not get that same error, some more details might help me figure out where this error comes from. Hey, thanks for responding. I think this script would be really really useful if I could get it to work. Went back and copied and pasted directly from the menu.py and init.py into my custom init and menu. I did have to change the /Icons to /icons because I already have a /icons folder. But I think put the icon in the /icons folder and the icon shows up fine. I'm on 8.0v3 and on OSX Mavericks. I also, just because I can, installed your relinker script and it works great, so I don't think it's a path thing. I replicated your error by removing the Toolsets folder. The reason the noneType can't find the showControlPane l command is likely due to that it can't find the nukefile inside the ToolSets folder. Copy the ToolSets with the nuke file inside it to your .nuke folder. If you already did this, make sure that the path to this nuke script is correct in the disableNodes.py file. toolsetpath = os.getenv("HOME ") + "/.nuke/ToolSets/disableNodes_v1.1.nk"
Hope this solved the problem. Glad it worked out, and thanks for testing the other tool! Added more features, and changed the tool from a toolset to a gizmo. The tool now stores the original color of the node. when the liked nodes are disabled, all the nodes turns red, so its easy yo see that they are disabled. A simple visual que for the compositor so he is aware and dont forget to enable the node before rendering the script. Also removed the disable/enable button as i always used the 'd' shortcut. And more options for linking and unlinking to give full control to the user. First, thanks a lot for this gizmo. Can you add a button to disable the motionblur inside any Transform node(including corner pin, tracker and stabilize nodes)?